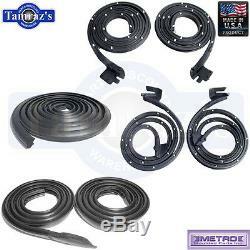 Weatherstrip Kit 4 Door Hardtop. High Quality OEM Style Replacements. 1 pair of Front Door Weatherstrips. 1 pair of Rear Door Weatherstrips. 1 pair of Roof Weatherstrips. 1 Trunk Weatherstrip / Seal. Fits the following 4 Hardtop Models. 1966 - 1967 Buick Skylark. 1966 - 1967 Chevrolet Chevelle - Malibu. 1966 - 1967 Oldsmobile Cutlass - F85. 1966 - 1967 Pontiac LeMans - Tempest. Has a very smooth skin that is free of exposure cells or flaws. Is composed of micro-closed cells that are uniform in size, providing even compression and sealing so you won't have to slam your doors. Is jet black, not ash gray, for a refined, concours look. Molded using computerized temperature control for consistent cure cycles. This prevents scorching or undercured parts. Weatherstrips are hot bonded at the joints. Sponge is made in the U. Is guaranteed for a full 15 years. Each parts comes with a certificate of guarantee. The item "66-67 GM A Body Weatherstrip Seal Kit 7 Pieces Kit 4 Door Hardtop Metro USA Made" is in sale since Wednesday, February 10, 2016. This item is in the category "eBay Motors\Parts & Accessories\Car & Truck Parts\Glass\Auto Seals". The seller is "tamraz" and is located in Naperville, Illinois.